Except when they come and stay. Then you know you’ve got a winner. a strong foothold in striped bass fishing. in the TV fishing shows. They were the “buzz” when introduced, and are more so now. and asked him how the business was going. Mid Atlantic, the range of striped bass. Why did they become so popular? “It sounds silly, but they work,” Tony said. an article in the October issue of Saltwater Sportsman said. heavy stainless steel to sink deeper. The out-rodders, rod holders used for trolling, are unique because they’re hinged, allowing the holder to be lifted to the upright position to remove the rod after hook-up. 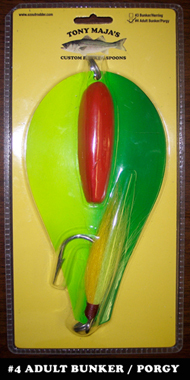 Of course, the out-rodders can be used for any kind of trolling, not only for striped bass. Tony, who retired to Bayville near Barnegat Bay after living on Staten Island, has been making his own bunker spoons for 40 years. One day he watched a striped bass pounce on a wounded bunker among a load of the batifish schooling in the ocean. A light bulb went off, he said, and he began making his spoons to imitate a wounded baitfish. After his tackle was perfected, he introduced it to major tackle shops in the heart of striped-bass-trolling areas. The shops included Sea Isle Custom Rod Builders on Long Island, Michael’s Bait & Tackle on Staten Island, The Tackle Box in Hazlet and The Reel Seat in Brielle. The products took off, and a distributor now spreads them to new areas. Tony currently fields a couple of dozen phone calls and e-mails a day from the public, asking about the products, he said. “Not bad for a retired guy, huh?” he asked. Looks like his products are here to stay.